On July 4th 1776, the thirteen colonies signed the Declaration of Independence and it has since been hailed as America’s Independence Day. On this day, even 242 years later, Americans take the day off to commemorate the occasion, by having barbecues full of traditional American food and fireworks to showcase our allegiance to our country. We adorn ourselves in red, white, and blue and sing the National Anthem with our hands over our heart, loud enough for the world to hear. And most importantly, we hang our beloved flag, our most precious representation of America, from our homes to show our pride. However, the American flag’s nationalistic symbolism has faltered in the eyes of some Americans and has become a souvenir of America’s racist history. For minorities, who were not considered equals when the flag was created, the flag is a harsh reminder of their ancestors’ struggles, and in turn, the struggles that they still face today. 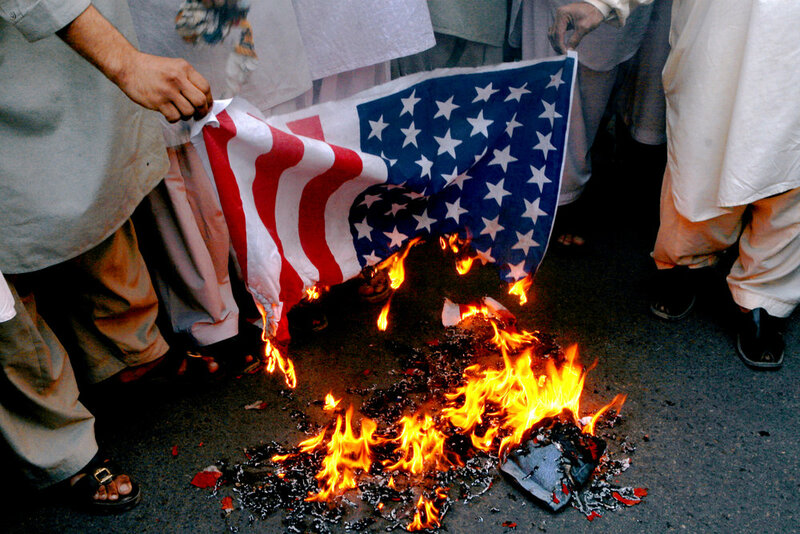 With the combination of the polarized political stances of the U.S and the progression of online activism, people have been publically destroying the American flag by stepping on and burning it on social media. Essentially, destroying the flag has become a form of protest for the injustices that minorities in this country still endure today. These Americans believe they do not owe allegiance to a country that has not, and continues to not, protect and represent them. The heated discourse around this controversial form of protest has taken place everywhere – from inside the home to on national television. Those against it say that it is disrespectful to our country, particularly to troops and veterans, who fight for our country’s safety and the freedom we fought for from England in the first place. On the other hand, supporters claim that is their First Amendment right to protest in this manner and that people are becoming more protective of the physical flag itself, and not the ideals it’s supposed to represent. This debate of respect versus protest has come up with not only the flag but also with several other nationalistic symbols of our country, including the national anthem. NFL player Colin Kaepernick knelt during the national anthem for the first time in August 2016, in honor of people of color who were victims of police brutality. His action sparked a revolution, leading several athletes all over the country and across various sporting platforms to take a knee during the national anthem as well. In the midst of this outrage, the NFL recently announced its position on the issue - that players who kneel during the anthem will now be fined. On top of this, after rallies in Charlottesville, Virginia turned violent due to the tense racial climate following the Charlottesville church shooting, statues of monumental Confederate figures are being removed across the country. The fundamental issue is whether worship of nationalistic symbols is suppressing people’s right to challenge the government. Patriotic symbols are a part of what makes any country’s bond tighter, but isn’t the ability to also point out wrongs in its country more important? The reality is that these symbols are essential to our history, but the feelings they evoke are not the same for every person. We are all fortunate to be in a country where we are able to express ourselves and our convictions in any way we choose, without fear of losing our lives or backlash from the government. That is America’s blessing. Not the flag itself. The flag is just a physical representation of our freedom, but through actual protest, we are doing the most American thing possible. So this Fourth of July, do not be surprised if you scroll through social media to find people burning the American flag. Although it may not be the version of protest you prefer, the most American thing you can do is accept that this is America, a land where we are free to protest the way we want to. Musée Magazine is a non-profit organization. To remain free online, we require hundreds of hours of labor per month to research, write, and sustain. Please support Musée Magazine with a tax-deductible donation of your choosing, whether big or small. Jun 28 "People Are Not Statistics"
Site designed by SHAHID &AMP COMPANY. ALL IMAGES, TRADEMARKS, AND TRADE NAMES ARE THE PROPERTY OF THEIR RESPECTIVE TRADEMARK HOLDERS © 2018 MUSÉE. ALL RIGHTS RESERVED. PUBLISHED BY MUSÉE. Musée Magazine. Established 2011.